Aims and Objectives: Modern methods of caries prevention concentrated on natural ingredients usage such as probiotics and polyphenols that are safer for young children with Streptococcus mutans inhibitory properties. The purpose of this study was to compare antibacterial effects of different concentration of Cyperus rotundus extract and chlorhexidine (CHX) 0.2% mouthwash on S. mutans and Lactobacillus acidophilus. Materials and Methods: In this in vitro study, the antibacterial effectiveness of the C. rotundus extract and CHX was compared with minimum inhibitory concentration (MIC) test in tube, minimum bactericidal concentration (MBC) test in solid medium, and disc diffusion for measurement of inhibition zone. Data were analyzed using one-way ANOVA, one sample t-test, and independent sample t-test statistical methods by SPSS. 24 software (SPSS Inc., Chicago, USA). Results: MIC and MBC values of the C. rotundus extract were obtained 225 and 450 mg/ml, respectively, for S. mutans and 108 and 225 mg/ml for L. acidophilus, which are more than CHX (0.5, 1 res.). The inhibition zone increased in a dose-dependent manner but lower than CHX. Conclusion: The C. rotundus extract had antibacterial effects (bactericide and bacteriostatic) on S. mutans and L. acidophillus. Although this effect was lower than CHX. With regard to adverse effect of CHX, this extract can be a potential antibacterial agent. Dental caries is the most common disease in children  which is the result of factors such as oral flora, anatomic characteristics, and food diet. Streptococcus mutans and Lactobacillus acidophilus are two of the most important factors in dental caries. Cariogenic properties of S. mutans consist of adhesion to dental surfaces, acid production, and ability of living in acidic environment.,Lactobacilli are more important in dentin caries and caries progression. As dental caries can impose high expenses on societies, different methods have been introduced to prevent it. Due to the plaque-related diseases tend to remain localized than offensive more likely, local application of antibacterial agents is more effective than systemic prescription. Among antibacterial agents, chlorhexidine (CHX) mouth rinse has limited indication in children under 7 years old due to the probability of swallowing and tooth staining. Hence, modern methods for decay prevention are utilization of natural safe materials with bacterial inhibition such as probiotics and polyphenols for children. Polyphenols are one of the main compounds presented in plants  with various biological activities such as antioxidant  and anti-inflammation properties. Some studies showed that plant-derived compounds have antibacterial and antiplaque formation properties which are the results of their effects on S. mutans. These effects divided into three main groups: (1) direct effects with antiproliferative properties, (2) interfering with cell membrane proteins caused to low adherence of bacteria to surfaces, and (3) inhibiting enzymatic system of bacteria through inhibiting glycosyltransferase and amylase. One of the important plants in oral treatment in traditional medicine of Iran and other countries such as India and China are Cyperaceae.,, In modern medicine, various investigations represent antibacterial, antitumoral, antimutagen, antitoxic, anti-inflammation, analgesic, and antioxidant effect of this plant. Furthermore, phytochemical analysis of this plant shows some phenolic components such as flavonoids, coumarins, tannins, and phenolic acids. These compounds are responsible for pharmacologic properties of many herbal species. Antimicrobial effect of ethanol extract of Cyperus rotundus was shown in several studies. In addition, some researches showed the effectiveness of this extract on Gram-positive bacteria.,,, Furthermore, C. rotundus exerted virucidal effect on HSV. Anti-HBV active constituents were isolated from the rhizomes of C. rotundus. Only one research investigated C. rotundus anticariogenic properties of the C. rotundus extract. They founded that the tuber extract of C. rotundus had growth reduction effect on S. mutans, but they did not compare with positive control. Since S. mutans and Lactobacillus, as major cause of dental caries, are Gram-positive bacteria and due to antibacterial effect of C. rotundus on these bacteria and its antibacterial component (polyphenol), this research focused on comparison of antibacterial effect of various concentration of ethanol extract of C. rotundus on S. mutans and L. acidophilus with CHX and penicillin. This laboratory study was done in Kerman University microbiology laboratory with 8-week period. The Institutional Ethical Committee of Shahed University approved the study (IR Shahed REC.1395.35). The rhizome of C. rotundus extract preparation was gathered from Tehran suburban gardens. The plant extract was prepared according to percolation method. Before interance in percolator, the plant was moistened with ethanol 70% as solvent (about 30 min). After the extraction, excessive solvent was vaporized with rotary device and then was sterilized with ultraviolet. Finally, the extract was obtained with concentration of 900 mg/ml. 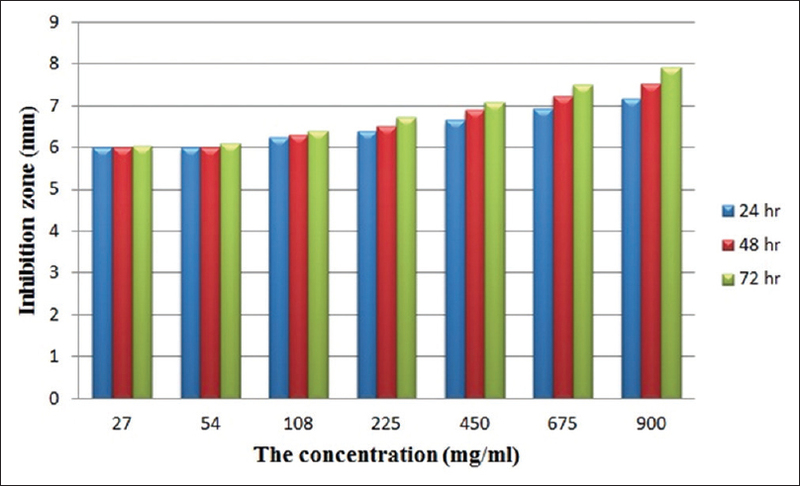 Amount of total phenolic content (TPC) was assessed using Folin-Ciocalteu reagent. Briefly, 50 mg of dry mass of C. rotundus extract was mixed with 0.5 mL of Folin-Ciocalteu reagent and 7.5 mL deionized water. The mixture was kept at room temperature for 10 min, and then, 1.5 mL of 20% NaCO (w/v) was added. The mixture was heated on a water bath at 40°C for 20 min and then was cooled in an ice bath. The absorbance was measured at 755 nm using a spectrophotometer (U-2001, Hitachi Instruments Inc., Tokyo, Japan). Amounts of TPC were calculated using gallic acid calibration curve within range of 10–50 ppm. The results were expressed as gallic acid equivalents mg/100 g of dry plant matter. The results were reported on dry weight basis. The bacteria strains S. mutans (PTTC 1638) and L. acidophilus (PTCC 1683) were purchased from Iranian Research Organization for Science and Technology. The lyophilized bacteria were cultured on Mueller-Hinton blood agar (Merck co, Germany) medium and were incubated for 48 h at 37°C. First, 10 sterilized test tubes were prepared and 2 ml culture medium (Mueller-Hinton broth [Merck, Germany]) was added to each tube. In this study, the extract used at 27, 54, 108, 225, 450, 675, and 900 mg/ml. One tube was considered as positive control without the extract (include culture medium) and one tube as negative control without m0069croorganism. 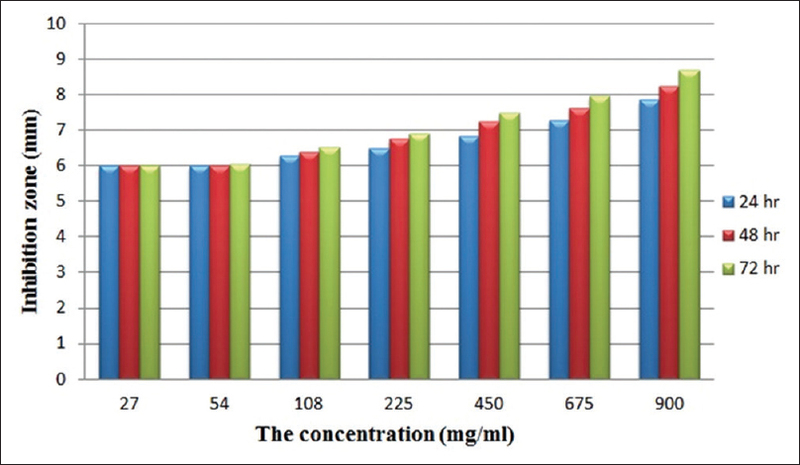 Then, 2 ml bacterial suspension with concentration of 0.5 McFarland was added to each tubes and tubes were incubated at 37°C for 24 h. The lowest concentration of the extract inhibited growth of bacteria was selected as minimum inhibitory concentration (MIC). Fifty microliter suspensions from tubes that showed no bacterial growth was cultured on the plates containing solid medium (blood agar) and were incubated for another 24 h at 37°C. The lowest concentration that inhibited 99% of organisms was considered as minimum bactericidal concentration (MBC). MIC and MBC of CHX and penicillin were also measured. Discs were soaked in different concentrations of the extract, CHX 0.2% and penicillin 500 mg (positive controls). Different concentrations were prepared with dimethyl sulfoxide as solvent and negative control. Twenty-four hours after complete absorption of the extract, discs were placed in incubator at 37°C for 1 h. Next, 50 μl suspension of bacteria with concentration of 0.5 McFarland was cultured to the plates containing blood agar medium. Then, disks were placed on the medium in proper distances (15 mm from center of disc) and were incubated in 37°C, and every 24 h for 3 days, diameter of inhibition zone was measured. TPC of the extract according to standard curve of gallic acid absorbance was obtained 10%. The value of MIC and MBC of the extract on S. mutans was 225 and 450 mg/ml, respectively. Furthermore, MIC and MBC of the extract for L. acidophilus were 108 and 225 mg/ml consequently. 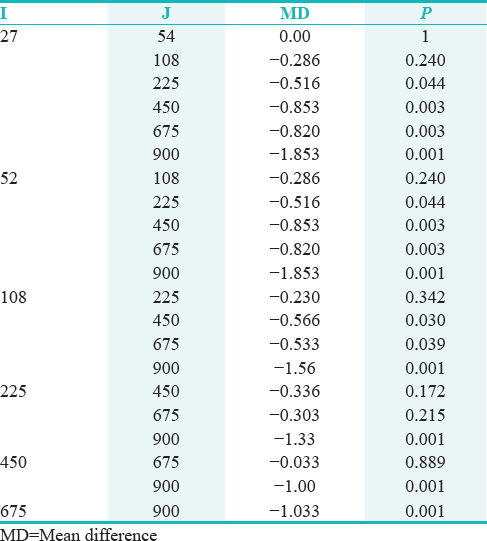 The value of MIC and MBC of CHX 0.2% were 0.5 and 1 mg/ml and were 60 and 125 mg/ml for penicilin, respectively [Table 1]. The MIC and MBC of the C. rotundus extract on S. mutans and L. acidophilus had a significant difference with MIC and MBC of penicillin and CHX 0.2% as shown in [Table 1]. Although MIC and MBC of the extract on L. acidophilus were lower than S. mutans. Three repeat of the test and effect of time on inhibition zone were not assessed with one-way ANOVA. Differences between three replicates of disc diffusion method were not significant (F(2, 60)= 0.929, P < 0.400 for S. mutans) (F(2, 60)= 0.096, P < 0.934 for L. acidophilus). Furthermore, time elapsed from 24 h to 72 h did not change the inhibition zone significantly (F(2, 18)= 0.375, P < 0.0.693 for S. mutans) (F(2, 18)= 0.305, P < 0.741 for L. acidophilus). The result of inhibition zone was shown in [Figure 1] and [Figure 2]. There is a significant difference between the extract concentrations with one-way ANOVA (F(6, 14)= 12.53, P < 0.001 for S. mutans) (F(6, 14)= 15.28, P < 0.001 for L. acidophilus). Since the result of ANOVA is significant, the least significant difference post hoc test must be reported [Table 2] and [Table 3]. As shown in these tables, the extract demonstrated antibacterial activity against S. mutans and L. acidophilus in a dose-dependent manner significantly. Amount of inhibition zone for S. mutans with penicillin was 16.85 mm and with CHX was 13.85 mm. Furthermore, the inhibition zone for L. acidophilus with penicillin was 17.35 mm and with CHX was 14.23 mm. There is a significant difference between all concentrations and positive controls in two tested bacteria with one sample t-test (df = 8, P < 0.001). All inhibition zones were lower than positive controls but higher than negative control (df = 8, P < 0.001). 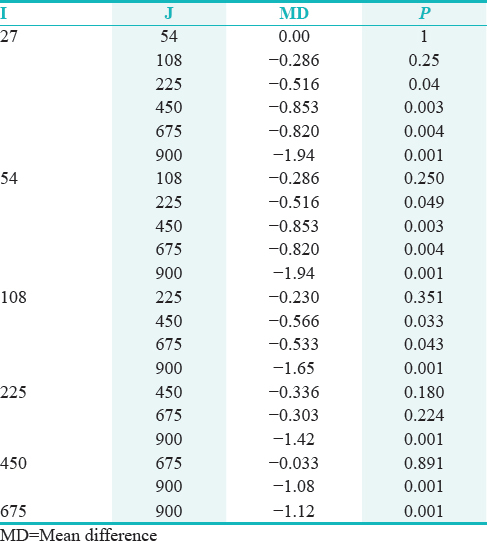 There is a significant difference between two tested bacteria with independent t-test (t = 1.97, df = 124, P < 0.05) [Table 4]. As shown above, there is a significant difference only in 900 mg/ml. With regard to antibacterial properties of C. rotundus on Gram-positive and lack of investigation in this area, this research focused on assessment of antibacterial effect of different percentages of ethanol extract of C. rotundus and comparison with CHX. As mentioned above, TPC obtained 10% of the extract that had antibacterial effect on S. mutans and L. acidophilus in a dose-dependent manner. Although the extract inhibition zone was higher than negative control, comparison of inhibition zone between two tested bacteria showed only 100% of the extract (900 mg/ml) was significantly more in L. acidophilus than S. mutans. In other percentages, there was no difference between two bacteria. MIC and MBC of the extract were more than positive controls. Direct comparison of different studies is so difficult because of variety in microbial surveys, microbial species, sucrose existence in plates, herb culture area, extraction method, and other interventional parameters. Our TPCs of C. rotundus extract were higher than Bashir et al. This diversity was related to different cultivation area of the plant. The present study was concordant with Yu et al. who found C. rotundus extract reduced S. mutans growth in a dose-dependent manner. Although they used tuber extract and had different microbial test (optical density). Furthermore, they did not compare the extract results with NaF 1% as positive control. MIC values of Sharma et al. were similar to ours. They found 250 mg/ml as minimum inhibition concentration of Gram-positive-tested bacteria. Furthermore, Prasad showed that ethanol extract of C. rotundus had the most effect on Streptococcus. Various researchers have already shown that Gram-positive bacteria are more susceptible toward plants extracts as compared to Gram-negative bacteria. These differences may be attributed to the fact that the cell wall in Gram-positive bacteria is of a single layer, whereas the Gram-negative cell wall is multilayered structure. Traditional medicine practitioners make use of water primarily as a solvent, but studies have shown that alcohol extracts of plants are much better and powerful. This may be due to the better solubility of the active components in organic solvent. The present study was similar to Mehta et al. because of the effectiveness of alcoholic extract of C. rotundus on Streptococcus but apposing with them for durability and substansivity. Their results showed reduction of inhibition zone (from 24 h and 72 h); but here, despite of increase in most cases, there was no significant difference between different times. In the present study, all of the agents had good antibacterial effects. However, potency of the extract was lower than control agents, but this point is less important than safety of the herb. Several studies confirmed safety of the extract.,, Hence, it is compatible and safe therapy for long-term use in human subjects. Moreover, the extract had more potency on tested bacteria particular on Lactobacillus than S. mutans that can be a base for further investigations. It is suggested assessment of anticariogenic effect of the C. roturdus extract on other cariogenic bacteria. Hence, extract of other cultural areas selects for extraction and compare with other mouth rinses. Finally, clinical researches should assess the in vivo effect of mouth rinses of this beneficial herb. With regard to remarkable antibacterial effect of the ethanol extract of C. rotundus on S. mutans and L. acidophilus and safety of this herb, it can be a new horizon for production of new preventive mouth rinse for tooth diseases. Dean JA. McDonald and Avery's Dentistry for the Child and Adolescent. Mosby: Elsevier Health Sciences; 2015. Casamassimo PS, Fields HW Jr., McTigue DJ, Nowak A. Pediatric Dentistry: Infancy through Adolescence. Netherlands: Elsevier Health Sciences; 2013. Listl S, Galloway J, Mossey PA, Marcenes W. Global economic impact of dental diseases. J Dent Res 2015;94:1355-61. Lobo PL, de Carvalho CB, Fonseca SG, de Castro RS, Monteiro AJ, Fonteles MC, et al. Sodium fluoride and chlorhexidine effect in the inhibition of mutans streptococci in children with dental caries: A randomized, double-blind clinical trial. Oral Microbiol Immunol 2008;23:486-91. Arakawa H, Maeda M, Okubo S, Shimamura T. Role of hydrogen peroxide in bactericidal action of catechin. Biol Pharm Bull 2004;27:277-81. Bhattacharya A, Sood P, Citovsky V. The roles of plant phenolics in defence and communication during Agrobacterium and Rhizobium infection. Mol Plant Pathol 2010;11:705-19. Ferrazzano GF, Amato I, Ingenito A, Zarrelli A, Pinto G, Pollio A. Plant polyphenols and their anti-cariogenic properties: A review. Molecules 2011;16:1486-507. Adeniyi TA, Adeonipekun PA, Omotayo EA. Investigating the phytochemicals and antimicrobial properties of three sedge (Cyperaceae) species. Notulae Scientia Biologicae 2014;6:276. Prasad MP. Analysis of antimicrobial compounds in Cyperus rotundus and Azadirachta indica against human pathogens. Int J Curr Microbiol Appl Sci 2014;3:206-10. Pirzada AM, Ali HH, Naeem M, Latif M, Bukhari AH, Tanveer A. Cyperus rotundus L.: Traditional uses, phytochemistry, and pharmacological activities. J Ethnopharmacol 2015;174:540-60. Kabbashi AS, Mohammed SE, Almagboul AZ, Ahmed IF. Antimicrobial activity and cytotoxicity of ethanolic extract of Cyperus rotundus L. Am J Pharm Pharm Sci 2015;2:1-3. Sharma SK, Singh AP. Antimicrobial investigations on rhizomes of Cyperus rotundus Linn. Der Pharmacia Lettre 2011;3:427-31. Al-Snafi AE. A review on Cyperus rotundus a potential medicinal plant. J Pharm 2016;6:32-48. Yu HH, Lee DH, Seo SJ, You YO. Anticariogenic properties of the extract of Cyperus rotundus. Am J Chin Med 2007;35:497-505. Tsai TH, Tsai TH, Chien YC, Lee CW, Tsai PJ.In vitro antimicrobial activities against cariogenic streptococci and their antioxidant capacities: A comparative study of green tea versus different herbs. Food Chem 2008;110:859-64. Bashir A, Sultana B, Akhtar FH, Munir A, Amjad M, Hassan Q. Investigation on the antioxidant activity of Dheela Grass (Cyperus rotundus). Afr J Basic Appl Sci 2012;4:1-6. Adeonipekun PA, Adeniyi TA, Aminu SO. Investigating the phytochemicals and antimicrobial activities of shoot and root of Pycreus smithianus (Ridl.) CB Clarke (family cyperaceae). J Bot 2014. Kumar V. Medicinal uses and pharmacological activitiesof motha (Cyperus rotundus Linn. ): A potential herb. In: Status and advancement in Ethnobotany. Kerala: Santosh Kumar; 2016. Sivapalan SR. Medicinal uses and pharmacological activities of Cyperus rotundus Linn – A review. Int J Sci Res Publ 2013;3:1-8.
de Boer HJ, Kool A, Broberg A, Mziray WR, Hedberg I, Levenfors JJ. Anti-fungal and anti-bacterial activity of some herbal remedies from Tanzania. J Ethnopharmacol 2005;96:461-9. Mehta M, Bharmuche A, Bhatkal A. Investigation of the anti-microbial and anti-inflammatory effect of Cyperus rotundus on Tonsillitis. Int J Curr Eng Technol 2013; (Special Issue1):135-8. Singh N, Pandey BR, Verma P, Bhalla M, Gilca M. Phyto-pharmacotherapeutics of Cyperus rotundus Linn. (Motha): An overview. J Nat Prod 2012;3:467-76.